Shiv Kapur and SSP Chowrasia shot contrasting rounds to make the midway cut at the Made in Denmark golf tournament in Aalborg, Denmark. Kapur carded a bogey-free 68 with three birdies, all between 10th and 12th, while Chowrasia had two birdies and two bogeys for his 71. Chowrasia had two birdies on second and fourth and bogeyed fifth and 15th holes. Both Kapur and Chowrasia were tied 13th at the midway stage. Also making the cut was Gaganjeet Bhullar (73-70), while Jeev Milkha Singh (73-75) collapsed in second round to miss the cut. Bradley Dredge birdied four out of his last six holes at Himmerland Golf & Spa Resort to open up a four-stroke lead at the halfway mark. The 41-year-old Welshman, who is slowly regaining his form after an injury-ravaged 2013, birdied the 13th, 15th, 16th and 18th holes for three-under par round of 68 to move to eight under par, with Englishman Simon Wakefield (67) being his nearest rival on four-under par. Dredge won his last title in 2006 at the Omega European Masters and is in 182nd place in the Race to Dubai. Dredge's main rivals will be Thomas Björn (73) and Thorbjørn Olesen (70), who are tied for third position on three-under par, along with Scotland's David Drysdale and England's Garrick Porteous, both of whom signed for rounds of 68. Fiji International as he returned a card of 75 to drop to tied 20th with one more round to go. Lahiri is two-over 218 after 54 holes. 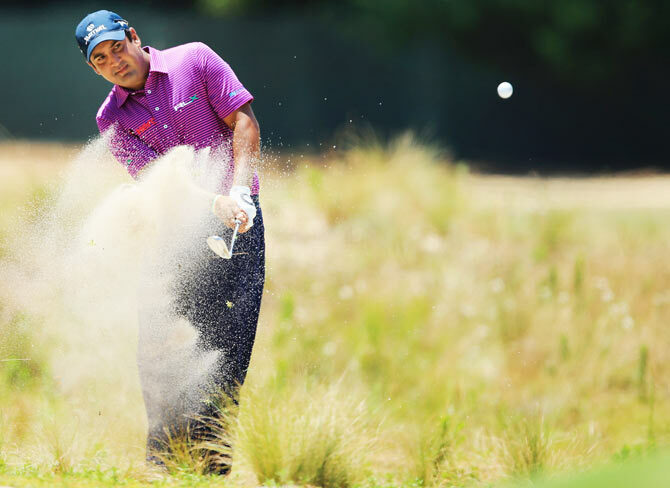 On Friday, Lahiri made the cut with a good second round, but faltered in the third round on Saturday. Lahiri, who came in from US after playing the PGA Championship, had had rounds of 74, 69 and 75. He said, "The second round felt good especially after the long journey to get here from the States. I am in a nice position going into the weekend." Rising star Jake Higginbottom from Australia bounced back from a mid-round slump to keep the lead along with compatriot Steve Jeffress. Higginbottom, the leader by two at the start of the day, carded a one-under-par 71, while Jeffress shot a 69 to put them in front on eight under. Australian Andrew Dodt is two strokes back after coming in with a 71 on another blustery and difficult day at Natadola Bay Championship Golf Course. Fijian star Vijay Singh, who designed the scenically stunning coastal course, fired a 70 and is one over for the tournament in a tie for 15th. 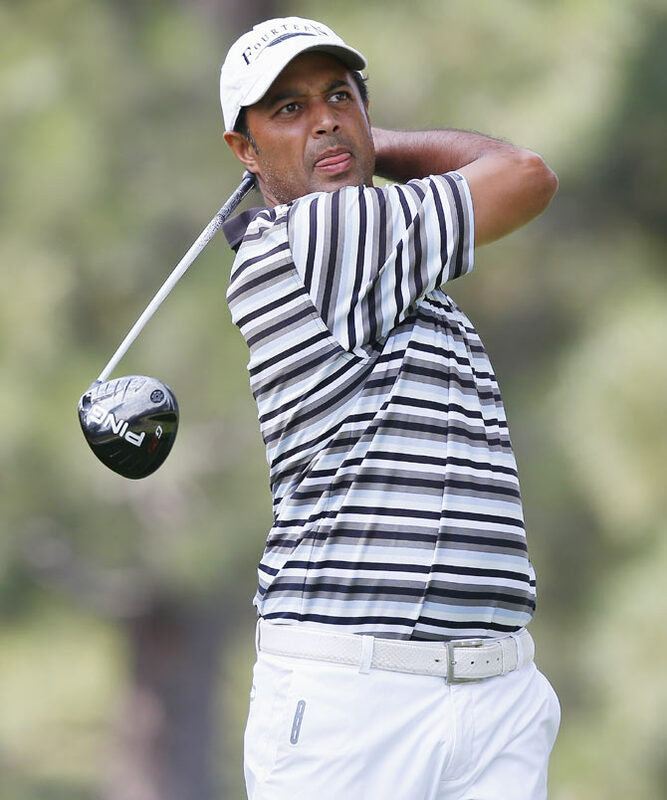 Arjun Atwal missed the cut yet again with a second round 71 at the Wyndham Championships, Greensboro, US, an event that has been one and only title on the PGA Tour. The Indian golfer, who does not have a card this season and is dependent on invitations, finished with 71-71 and missed the cut by a wide margin as it fell at two-under 138. Also missing the cut was Daniel Chopra (76-70). Heath Slocum, who came to the event at Wyndham Championship ranked 128th, needs to finish third or better on Sunday to advance to FedEx Play-offs. After a second-straight 65, Slocum is tied at the top of the leaderboard with Scott Langley, who is safely in the Playoffs after coming in ranked 81st. Langley matched Slocum's 65 in second round. The two are one stroke ahead of Brian Stuard, Nick Watney, Martin Laird and Andrew Svoboda, who birdied the 17th hole to get to 10 under but missed the green and a 7-footer to save par at No. 18. Svoboda and Watney shot 64s, Stuard had a 65 and Laird signed for a 66. Slocum's last top-10 finish came way back in 2010 when he won The McGladrey Classic. Will men's tennis see a flurry of women coaches?